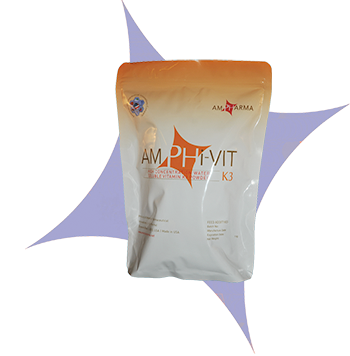 AmPhiVit K3 is a high-concentration, water-soluble Vitamin K3 powder. Vitamin K is a cofactor in the post-ribosomal synthesis of clotting factors including factor II (prothrombin, VII (proconvertin), IX (plasma thromboplastin component) and X (Stuart factor), as well as of Proteins C and S that are involved in the production and inhibition of thrombin. Vitamin K hypovitaminosis results in hypoprothrombinemia, which in turn, leads to prolonged bleedings, large haematomata, and the development of severe haemorrhagic anemia and haemolytic jaundice. Menadione (synthetic Vitamin K3) is absorbed by diffusion in the distal portions of the small intestine and colon, and metabolized to diol (hydroquinone) form and excreted as glucuronide and sulphate conjugates. AmPhiVit K3 is indicated in the prevention of hemorrhages associated with Vitamin K deficiency or intestinal parasitic infections such as coccidiosis, and as an antagonist for anticoagulant poisoning (e.g., due to rodenticide toxicity, sweet clover poisoning or treatment with sulfaquinoxaline) in calves, cattle, goats, poultry, sheep, and swine. For oral administration as a source of Vitamin K in preventing Vitamin K deficiency. Poultry: 1 kg / 2500 liters of drinking water for three to seven days. Calves, Goats, Cattle, and Sheep: 1 gm per 20-40 Kg of body weight. A Proprietary Patented Mix of Vitamin K3 and excipients.